The latest Warner Bros DC Comics movie has arrived on DVD and Blu-ray which features two of the world's most iconic characters together, Superman and Batman. 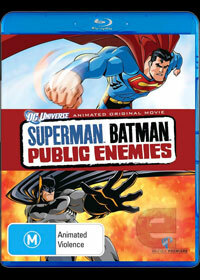 Based on the popular comic written by Jeph Loeb and illustrated by Ed McGuiness, Superman Batman: Public Enemies also incorporates a wide variety of characters from the DC Universe into the story that include Power Girl, Captain Atom and even Shazam. Of course, there are a plethora of villains behind this movie as well and the theme revolves around Lex Luthor... more specifically President Lex Luthor who frames Superman for the death of a super villain. Of course it didn't help that Superman never sided with the newly elected president of the United States but with Batman siding with Superman, both heroes are proclaimed Public Enemies and to compound the situation, not only do the villains want justice but also the super heroes of Earth which creates a huge game of cat and mouse. The story is well written and does pay homage to the original comicbook but the highlight of this movie for me was the interaction with other DC Characters such as Power Girl or the hot headed Captain Atom. Of course it helps that the animation looks almost identical to Ed McGuiness. All the characters are well voiced, especially Batman who is played by Kevin Conroy and Tim Daly who plays Superman and have played the voices of these characters before. As story is rated M15+, this can also be watched by adults who will also enjoy this intriguing story of a world gone mad. On Blu-ray, the video quality is extremely sharp with a great colour palette and strong levels of black with no artifacting at all. Match that with Dolby Digital 5.1 and you have a cinematic superhero treat that must be watched on the big screen to be truly enjoyed. Of course, the Blu-ray version features a truckload of special features such about the characters, what's happening in the DC Universe and some great interviews. -6 Cartoons handpicked by Bruce Timm.